Jude Winchester has paid tribute to Barry Gray and his coaches for the recent upturn in Cliftonville’s fortunes. 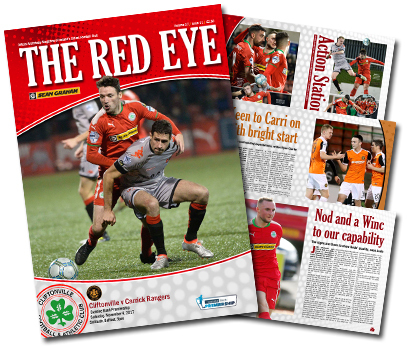 The Reds head into tomorrow’s Danske Bank Premiership encounter with Carrick Rangers having won seven of their last nine games following a notable improvement since September’s meetings with the same opposition – and Winchester has highlighted the role performed by the backroom team during the period. “Barry has got us playing really well at the moment,” says the 24-year-old. You can read the full Winchester interview in tomorrow’s edition of our Matchday Magazine, which will be on sale at Solitude for £2.50. Alongside boss Gray’s pre-game views, The Red Eye’s 11th issue of the campaign reviews Rangers’ recent form, delivers the latest addition to your player poster collections and turns the clock back 135, 67 and 28 years – plus plenty more besides.